Welcome to video two in the How to Play Guitar series. In this lesson, I’ll teach how to tune your guitar using an electronic tuner. Learning how to tune your guitar is an important skill because even if you were the best guitar player in the world, if your guitar is out of tune, you still won’t sound very good. If you already know how to tune your guitar, you can skip to the next lesson if you like. 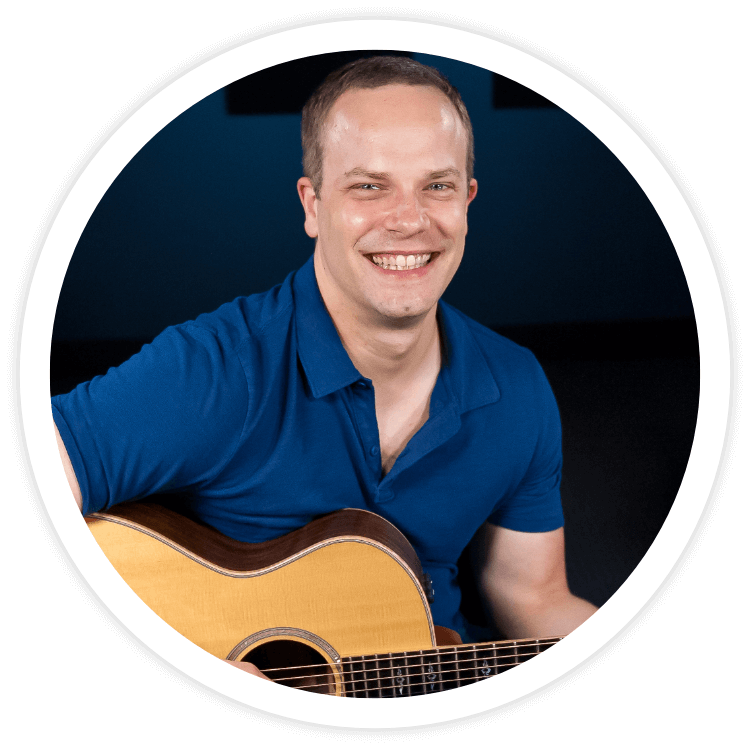 First in this lesson, I’ll teach you the names of the open strings on the guitar because you’ll need to know those in order to tune your guitar. I’ll also give you some tips to keep you from breaking strings, especially since I know a lot of new guitar players struggle with that. After that, I’ll teach you a two-step process to using an electronic tuner. Now I’ll give you some tips to keep you from breaking strings when you’re learning how to tune the guitar. The first tip is to make sure you’re turning the right tuning key for the string you’re trying to tune. For example, if someone is trying to tune the A string, often they accidentally use the wrong tuning key. They’ll keep turning it, wondering why nothing is changing, and that’s when a string accidentally breaks. When you’re learning how to tune, and tuning any time in the future, make sure you follow the string down the fretboard to double-check you are cranking on the right tuning key. The second tip I have for you to prevent you from breaking strings is if you think you are going too far with the string, you probably are. To be safe, stop right away. Loosen the string a bit, release the tension, and start again. When it comes to tuning your guitar with an electronic tuner, there are a many kinds of tuners you might have. My tuner clips on to the headstock of my guitar, but yours could be a regular handheld tuner. For this lesson, I’m going to use an app on my iPad to show you how to use a tuner. I’m going to teach you a two-step process for tuning each string, and since it’s critical to know the names of each string, make sure you have them memorized now. The first step of the two-step process is to match the note name of the string you are trying to tune to the name it should be. In the video, you can see that when I play the E string, it shows up on the iPad as close to a D, which is way off. Since E comes after D in the alphabet, you’ll know that the E string needs to come up a little. I slowly turn the tuning key to adjust the string from a D, to a D#, and finally to an E. In the two-step process, this is what the first step looks like as you match the note name to what it should really be. The second step in the process is to get the note right in the middle, right on the correct note. Looking at the iPad, you can see that my note is just a bit off-center. My E string is still a little sharp, so I need to bring it down. One extra tip here is to always tune up to the right note, instead of down to the note, because the guitar tends to stay in tune better this way. I’ll come down below the E first, and then bring it back up to the E note right in the center. You’ll want to go through this process on the next string, which is the A string. In the video, you can see that my A string is too sharp, so I need to bring it down. The first step is to make it an A note, but remember that we want to get it right in the middle without being too flat or too sharp. In the video, you can see me repeat this process with the D, G, B, and high E strings. You’ll see that I always follow the same two-step process. First I make the note name match what it should be, and then I slowly turn the tuning keys to tweak the note up so it’s perfectly in tune. Once I’ve tuned the strings, I’ll go through the process one more time to make sure all the strings are spot on. This whole process is how to tune your guitar with an electronic tuner. Just like everything you learn on guitar, learning how to tune the guitar does take practice. Over time, you will get better at it. Thanks for watching this lesson. In the next lesson, I’ll teach you how to play chords on the guitar. The chords we’ll go over will be some of your most commonly used chords, so it will be an important and enjoyable lesson. Enter your email address and click the blue button to get 50 beginner step-by-step video lessons for FREE!